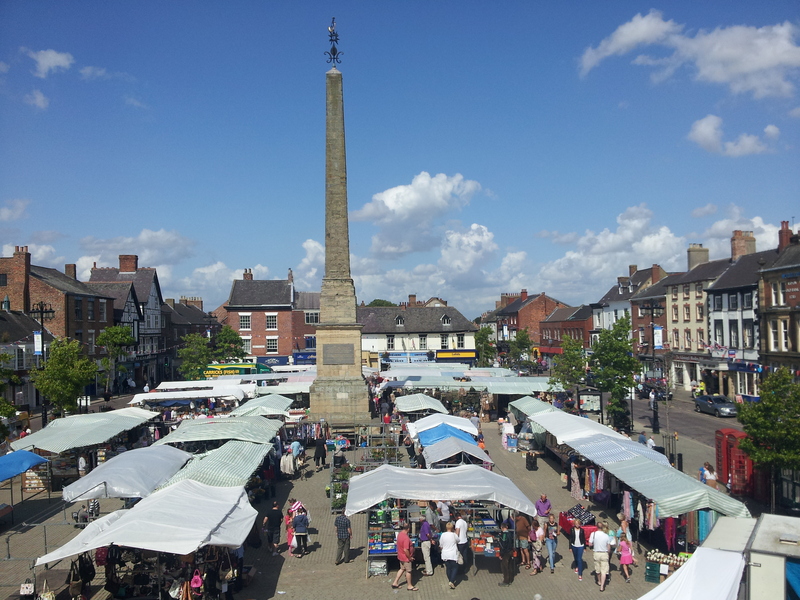 Ripon has grown up around its Market Place which has provided a focus for the life of the town and city. Most markets in England came into existence – or at least were first chartered – within two or three hundred years of the Norman conquest. Domesday Book was compiled in 1086 and about 50 markets are listed, and two fairs. Ripon was not included as having a fair but in 1228 the canons of Ripon Minster in a law suit against the Archbishop of York claimed to have had a Wednesday market and five day fair at the October feast of St Wilfrid, to mark his death, since Athelstan’s time as part of the liberty franchise of the Liberty of St Wilfrid created by King Athelstan in 924. Fairs usually coincide with major church festivals, and royal authority to hold a fair in Ripon was granted by King Henry I before 1129 to Archbishop Thurstan (1114-1140) of York. The fair was then a 4 day event in April around the Feast of St Wilfrid, and until the Market Place was laid out it is likely that the fairs were held outside the Minster Church. Indeed in 1292 the Archbishop claimed to have a Thursday Market, and two fairs of 3 days duration, one at the feast of St Wilfrid after Michaelmas and the other at the Invention of the Holy Cross, an anniversary associated with St Helen. It is likely that Ripon was granted burghal status in 1124 at the same time as Beverley and the Market Square would develop from that date. The law suit of 1228 provided evidence that the Canons and the Archbishop between them owned about half of the town each. From this evidence it is also clear that the Horse Fair was already in existence, as was the Archbishops market, probably the Old Market Place ,at the top of Allhallowgate. Leases of 1233, 1250 and 1273 all indicate that ‘Le Merkedsted existed as these leases were for burgages in the Market Place. The Archbishops of York were therefore responsible for changing the whole face of Ripon – by creating a brand new town centre to the west of the early church, and from the early 12th century, say 1124, the borough with its spacious market place was soon bringing the Archbishop a substantial income from its rents and tolls. The medieval street pattern which Ripon then acquired has survived largely unchanged to the present day. Medieval fairs were mainly for the sale of livestock, but other produce was also on offer, and there would be minstrels and other forms of street entertainment for the benefit of pilgrims and fair-goers. The Archbishop’s officers regulated the fairs and markets and collected the various tolls involved, but it was not a popular task and could lead to violence. Following the Royal charter of James 1 in 1604 the control of fairs and markets and the collection of dues passed increasingly to the town authority and to specific officers. But it was not until 1880 that the Ripon Corporation gained full control when it purchased the stallage from the Ecclesiastical Commission for £1500. Previously the Corporation had levied a corn –toll, and the opening of the market in the open square, opposite the Unicorn Hotel, was commenced by the Bell-Man ringing the Corn bell at 11am. Tradition has it that the Bell-Man must have large hands as the corn toll required him to take a handful from each sack of corn as toll. By the late 17th century Ripon was famous for its horse fairs, held in what is now North Street, and 19th century trade directories reveal a rota of fairs running throughout the year, mostly for horses, sheep and cattle, but there was also a wool fair in the Old Market Place in June. The November cattle fair was also the time of the Martinmas Hirings, when servants and farm labourers could be hired for the coming year. Livestock sales continued on the Market Square up to the First World War, but the animals created problems, often obstructing the roadway and fouling the cobbled surface of the Square, leading to it being concreted over in 1900. Sales were eventually transferred to the Auction Mart in North Road.